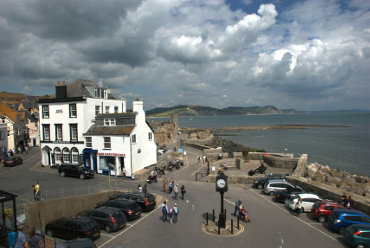 BeenThere-DoneThat: Lyme Regis (1), Dorset. 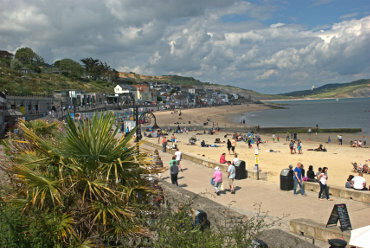 Lyme Regis is an attractive little town on the Dorset Coast and has the River Lym flowing through it which gives the town the first half of its name. This shows the view of the Square near the eastern edge of the town with that wonderful heritage coast curving away in the far distance. 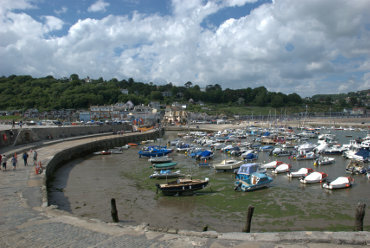 At the western edge of the town is the attractive little harbour called the Cobb and just to confuse things the stone wall which forms part of the harbour is known as the Cobb and the little 'village' at the inland end of the wall is called Cobb as well. The Cobb (wall) has featured in a number of films such as The French Lieutenant’s Woman and Jane Austen’s Persuasion. The original version of the wall was built in, or before, 1313 but the current construction dates from around 1824 after the wall was breached in a storm. The beach at the eastern end of Lyme Regis is mostly pebbles but at the western end near the harbour the beach is sand and fairly popular. Connecting the east and west parts of the town is Marine Parade immediately adjacent to the beach. This part of the Jurassic coast is also well known for its fossils. 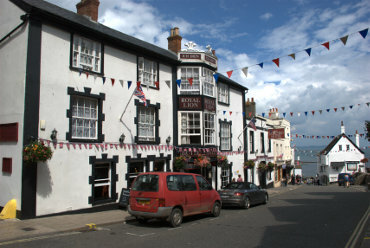 Part of Broad Street, looking towards the sea, showing the Royal Lion Hotel. Broad Street isn't very broad by today's standards, although it may have seemed so in the 13th century when Lyme Regis was a major British port, and it can get a little clogged up with traffic at times. We stayed in the Royal Lion Hotel for the duration of our visit in June 2014.